What thoughts come to mind as you look at those two words? I imagine it’s a bit of a mixed bag depending on what your experience has been like to this point. Maybe you already have a large email list you regularly send campaigns to. Perhaps you’re in the process of building enough contacts to communicate with. Maybe you don’t have an email list or don’t believe it could be a useful tool for you. Now, if you’re a musician that doesn’t believe in email, let me tell you one thing. The stats prove that email is a better marketing channel than social media. Social media is where you connect with people. Email is where you get the business done. So, I would recommend that you begin building your email list immediately if you desire a profitable career. One tool that can make your email marketing even more effective is marketing automation, which we’re going to get into now. “Marketing automation” has a good ring to it, doesn’t it? It sounds like something you could use to put your promotional efforts entirely on autopilot. And, who doesn’t want that? Well, in a manner of speaking, that’s what it does. But it’s still going to require some upfront work. You can’t get something for nothing. Certainly, technology is quickly getting to the point where you can do a lot without your direct involvement. But there’s still setup, which can be technical in nature. And, this type of tech is still new, so it can cost quite a bit. The kind of marketing automation we’re talking about here is mostly low-cost and not too difficult to set up. And, once it’s in place, the only thing you’ll need to do is tweak or add to it as necessary. 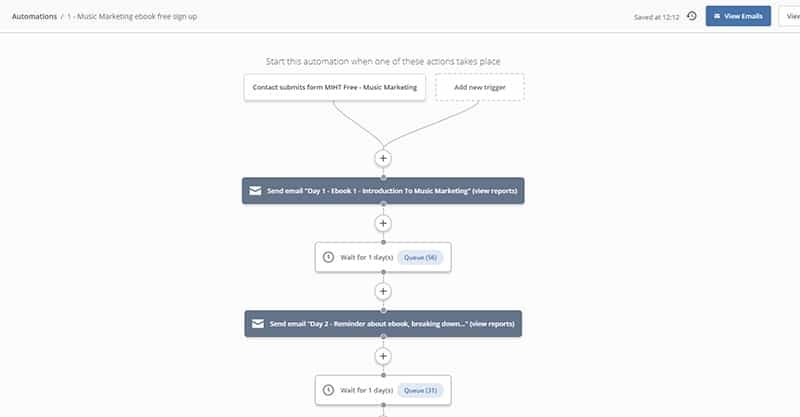 Marketing automation is basically any tool that allows you to put certain aspects of your marketing on autopilot. It’s great at handling repetitive tasks, such as sending emails to individual email subscribers at a specific, strategic time. 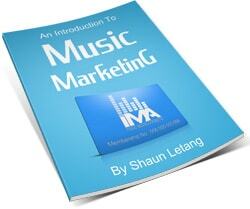 Email marketing can often end up being one more thing to do on a musician’s long list of to-dos. And, sometimes sending emails doesn’t have a dramatic impact on turnout at your concerts, album sales and streams, engagement on social media or otherwise. The reality is that it takes time to build a relationship with your subscriber base. Yes, they’ve already expressed interest in you in the sense that they decided it was worth getting email updates from you. But that doesn’t mean they’re ready to go to your events, buy your music or otherwise. With marketing automation, you can begin that process of building a relationship with your email database. And, doing so will result in profitable results down the line. 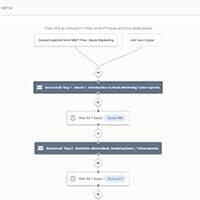 Also, as I already hinted at, you can save quite a bit of time with marketing automation. Sending weekly emails can be a bit of a drag, especially when your list is small or mostly unresponsive. Your efforts will pay off, but it’s hard to see that in the immediate. But if your email marketing was working for you in the background while you were busy doing other things, you would feel a lot better about it, wouldn’t you? Now, this doesn’t mean there won’t be ongoing work to do. But it does mean that your results can stack over time. When it comes to marketing automation, there are many tools available. But one thing you should be aware of is that many are feature-rich, sophisticated enterprise-level solutions that are unlikely to be suitable for the average musician. First, the technical skills required might be a bit intimidating. Second, it’s probably not going to suit your budget. That’s not a problem since you don’t need all those features (at least not right now). Some of the most basic email service providers (or ESPs) will do just fine. 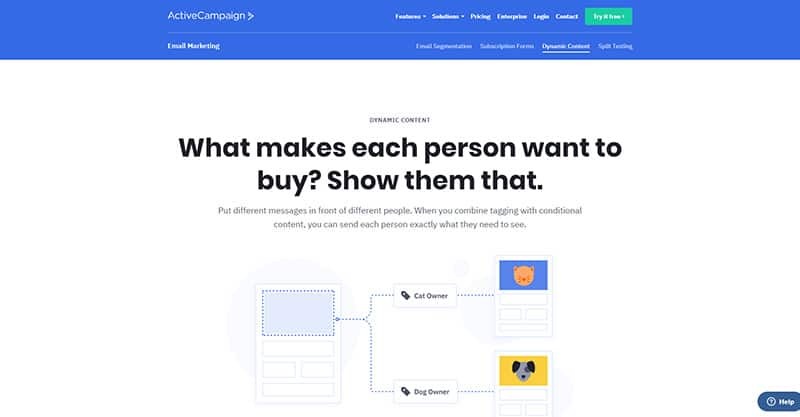 Even the simplest email marketing platforms now offer more marketing options than ever before. 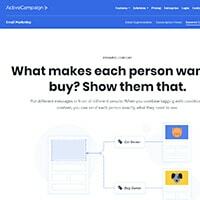 We recommend using ActiveCampaign, as it gives you marketing automation at a low monthly fee. But if you’re already using another platform, that’s okay. You should still be able to do most if not all the things mentioned in this guide. An autoresponder is simply a default message that goes out to people who email you, whenever they email you. My naturopath uses autoresponders. Whenever you email him, you get a message that basically says he’s with patients all day, but never leaves the office without checking his messages, and if you need immediate attention, that you should give him a call. An autoresponder is a newsletter or email campaign (or even a series of email campaigns) that goes out automatically to your mailing list. There’s a bit of an overlap here with what’s called a “welcome email series”, which we’ll be talking about later. But it’s safe to say that not everyone signs up to your email list at the same time, right? So, the people who first signed up with you have had the opportunity to get to know who you are and what you’re up to. They’ve been watching your journey unfold. Meanwhile, new subscribers don’t have any context for that. So, if your first email to them is “Summer 2019 Tour Dates”, it could be a bit off-putting, right? These emails could be sent daily, every three days, weekly… whatever makes the most sense for you and your audience. By doing this, you can warm your audience to the promotional messages you’ll be sending them later. And, I know some people worry about the fact that your new subscribers will be getting both your autoresponder sequence and your regular email messages, but I haven’t found that to be a problem. Also, again, autoresponder messages can be just about anything. You could have messages set up to promote early releases in your catalog. You could point your audience to a specific blog post that talks about your story. You could point people to press coverage you’ve received. If it helps you build a relationship with your audience, it can’t hurt. As I’ve already shared, there’s some overlap with autoresponders and a welcome email series, and sometimes they are the same thing. Many of the ideas I’ve already talked about also apply here. But I also want to give you some examples, so you can sink your teeth into this idea. Again, we know that new subscribers don’t have an existing relationship with you. Maybe they do, to the extent that they’ve listened to your music, been at a few shows, or have personally interacted with you. But beyond that, they don’t know you like some of your longtime fans do. For my website, I’ve set up a bit of a welcome email series that introduces my business to my new subscribers and gives them an opportunity to get to know me better. I’m not holding this up as the perfect example of a welcome series. There are still some areas I’m looking to improve, but through testing I’ve found the first two emails to be quite effective. The first message is exactly what it sounds like. It’s an introduction to my website and what we offer. The second message prompts users to respond with what they’re looking to get out of their career as a musician/music entrepreneur. The third message directs people to the most viewed content on the website. Users can scan and peruse this content to get a better sense of what we offer and what we’re about. Finally, the fourth message is for those who are just getting started in the music industry and need some direction. I’m planning to add an email that’s along the lines of “Hi, I’m David Andrew Wiebe”, so people can get to know who I am, what I’m up to and how I can help them. That’s one tweak I think would make a big difference to the success of the last two emails. And, I also intend to keep adding to this series, because of the success of the first two emails. Are you starting to get a sense of what you could do with your welcome series? Now, I’m going to go over some general best practices with the welcome series. But please note that there isn’t a perfect formula, and you will need to adapt it to your specific situation. This should be a simple “welcome” email. You’re introducing people to your music or band. Having a high-quality image of your band/brand at the top of the email is not a bad idea. If you wish, you can also include links to your social media platforms (most ESPs allow you to use stylish social media icons). The second email can be used to promote your most popular music release. If others have liked it, then it’s likely that your new subscribers will like it too. You could have a large, prominent image promoting your most listened to track, and smaller images below promoting other releases your fans have enjoyed. But it’s best to keep this simple, so it’s okay if you only showcase one release. It’s all well and good to tell your subscribers about who you are. But maybe you could use the third email to ask questions about your audience. It could be something as simple as, “what was the best concert you went to last year?” It’s a general question, but it could still help you flesh out who your audience is. Encourage your audience to reply to the email campaign with their thoughts. And, that’s it. You can add more emails if you want but this is a good starting point. Inevitably, some of your fans will check out your music and not buy it or listen to it on the spot. People are busy, and there are a lot of distractions, especially online. Most marketers would consider these people “low hanging fruit” because they’ve expressed some interest in your product (in this case, music). They just haven’t taken the next step. This is where cart abandonment emails (or sequences) come in. Now, we don’t have the space to talk about the exact mechanics of how this works. After all, people are typically buying music offsite, on third-party platforms like Bandcamp or iTunes. But the idea is that these people will get an email when they go to checkout, but don’t purchase. This is where you could offer a discount code or something like it to entice them to follow through. You can give your sales a significant boost by using cart abandonment emails. If the only thing you do with marketing automation is set up a welcome email series, the battle is half won. That action alone is worth its weight in gold and your new subscribers will love you for it. But the world of marketing automation is expansive, and there’s so much more you can do with it. My suggestion would be to start simple, and as you see a return on your investment, begin putting more effort into it.